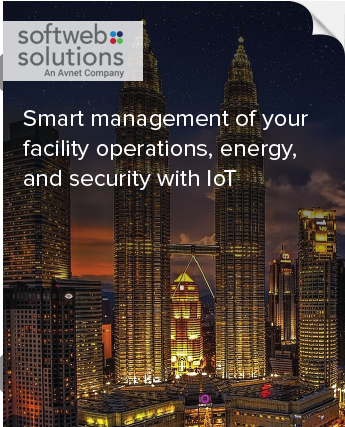 Share the post "IoT and analytics: Changing the reality of facility management"
The Internet of Things is routing new possibilities for building integrations and allowing the evolution of intelligent buildings. IoT makes it easy to understand the operations undergoing in an automated building environment, whereas analytics allow the supervisors to understand what is happening within every aspect of a building and a building automation system. IoT and analytics can be defined as a large number of data points brought together into a cloud environment in which certain models can be applied to influence the outcome. IoT uses one common Internet Protocol (IP) platform to connect all of the sensors and devices in a building to exchange and analyze information and optimize controls automatically. What’s facility management by the way? Before we jump to the discussion on how IoT and analytics are transforming the face of facility management at the present time, let’s first try to understand what facility management is all about and how it works. Outsourcing of non-core building management functions, privatizations of business operations, occupants’ experience management, tenant relationship management and business re-engineering are encompassed in the matrix of facility management. Although facility management is often mistaken as the design stage of a new building, it is related to the operations going on in the building. The in-house facilities management is responsible for managing the organization, the people, and the workplace to attain a fully functional smart building environment. 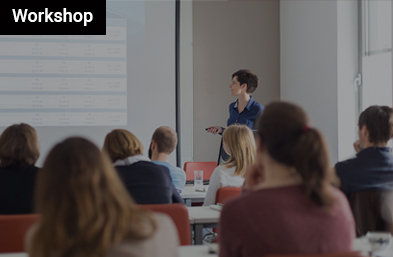 It is quite challenging to manage the supply chain and developing the requisite skill sets and capabilities to attend and manage the facilities in a building. Well, so to speak, a facility manager in a building has to progressively and regularly add value to the organization and maintain the balance between the optimum utilization of resources like manpower, assets, technology and most importantly cost-effectiveness while delivering the quality facility services in a building. Every demand a facility manager has to fulfil has a cost associated with it. Facilities like the hiring of staff, repairs & maintenance, inventory & supplies and safety & security are neither easy to get nor cheap to afford. In simpler words cost management is one of the toughest challenges a facility manager has to deal with. He has to balance the quality of the offered facility along with making it fit right into the budget. Another challenge a facility manager has to deal with is managing ageing inventory. As time passes, equipment and other machinery of the building start to age and begin to wear out. As a result, leakage and breakdowns become inevitable. A facility manager also has to take long preventive and proactive maintenance procedures affecting the quality of the offered facilities. For a facility manager, complying with the ever-changing regulatory and compliance standards is yet another roadblock to provide top-notch facilities. Keeping leading industry changes and required improvements on the same page is something a facility manager has to deal with. Security breaches and threats have sharply increased a facility manager’s concern about security-related responsibilities. This forces a facility manager to focus on the importance of emergency preparedness. In many organizations much remains to be done regarding emergency evacuation procedures. Bringing the organization up to speed is, therefore, a very challenging task. A facility manager is always occupied with some task or the other and always has his hands full with responsibilities to ensure the proper maintenance of the building. He may also find himself entangled in managing the balance between safety and cost-effectiveness for tenants and owners. Somehow, the facility provider fails to attend every request generated by different tenants and cannot efficiently track or attend to the issues. So what can be done? How can a facility manager effectively attend and resolve the issues requested by tenants? Well, this is where IoT and analytics come in handy. Digitalization has changed the perspective of a user and a supervisor of how a building is portrayed. Mobile technologies, wireless sensors, beacons and big data analytics have totally revolutionized how a tenant and a facility manager interact with each other and manage the facilities of a building. “Facility Management Market powered IoT and analytics, to grow from $24.65 billion in 2015 to $43.69 billion by 2020. This represents a Compound Annual Growth Rate (CAGR) of 12.1% from 2015 to 2020.” -MarketsandMarkets. To retain a customer, all his needs must be fulfilled and in order to make it possible, it’s required that the facility manager is able to attend every service request efficiently. IoT and analytics in facility management have the ability to provide real-time data to the facility manager. This, in turn, helps the occupant to get top-notch facility at minimal costs. A building equipped with IoT and analytics devices prevents inappropriate changes, like unauthorized access to your facility management system. Third-party facility management companies are effectively leveraging the power of IoT and analytics to solve cybersecurity or physical security threats. In simpler words, IoT and analytics enable companies to keep greater control over their environments while still allowing authentic occupants with user-access. As we discussed earlier that facility management is the matrix of perfectly blended services and physical assets, so, for better facility management, tracking and monitoring of assets is as important as taking care of facilities of the occupant. With IoT enabled devices and analytics, a facility manager can locate, monitor and allow access to the assets deployed for an occupant. IoT and analytics allow a facility manger to monitor assets like HVAC, escalators, ventilators, smoke detectors, etc. One of the many benefits of IoT and analytics in facility management is the ability to do more with less. Well, this means that the applied technology reduces energy reliance and optimizing the workforce of facility management companies. Employee standards are changing and the roles of facilities managers are evolving too. According to an independent report by Gartner, 25 percent of all businesses are using a chief digital officer as an extension of traditional facilities managers and have increased the efficiency in providing the quality facilities and service to the occupants by 50 percent. These benefits are the major reasons that are boosting the implementation of IoT and analytics in modern buildings. 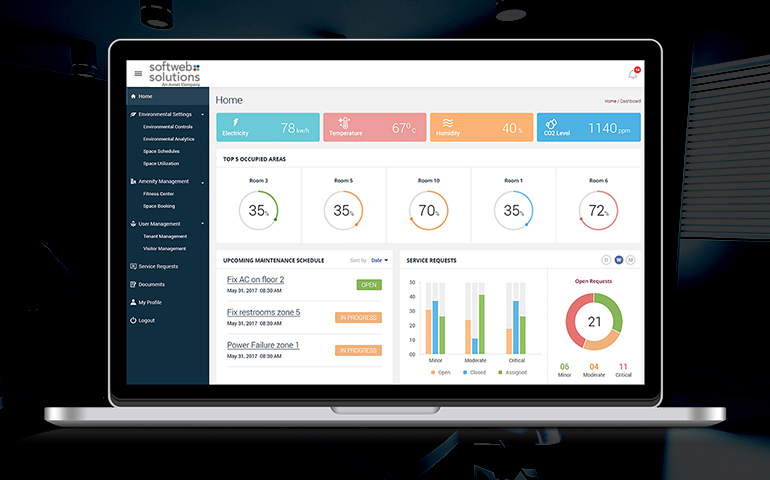 Softweb Smart Facility solution is a perfect blend of hardware, software and an IoT platform that makes your building resources more intelligent and sustainable. The solution allows facility managers to generate savings through efficient management of resources while planning efficient maintenance programs, minimizing energy consumption and maximizing tenant comfort.